Manoeuvring specialists and propulsion specialists have agreed to corporate, develop and optimise efficient aft ship solutions for the future ship designs. 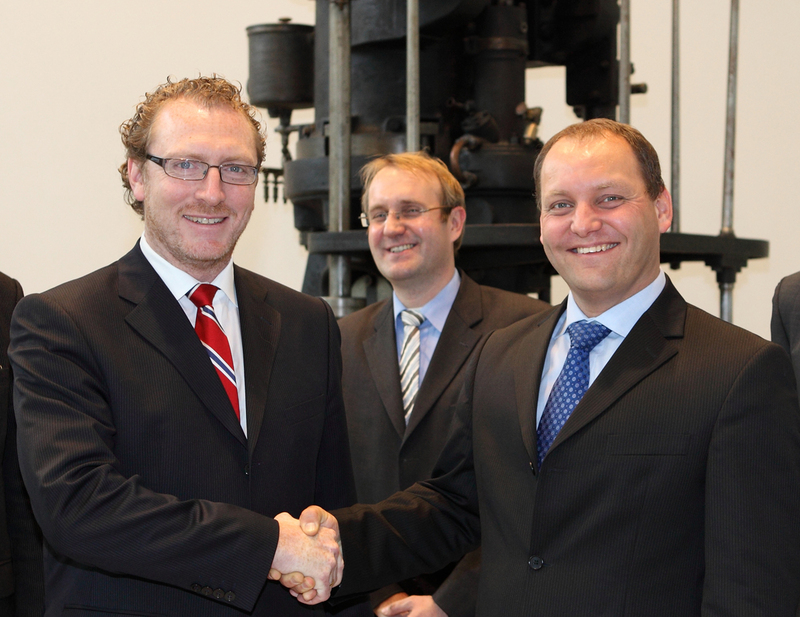 At a signing ceremony on 25 November in Augsburg, Germany a Cooperation Agreement was settled between Becker Marine Systems GmbH & Co. KG and MAN Diesel & Turbo SE. On an individual basis, both the manoeuvring and rudder specialists and the propeller and propulsion specialists of the marine industry have in parallel optimised their solutions in way of efficiency. And with great success efficiency gains have been exploited over time. The next step for further refinement and optimisation requires a more holistic approach to all the design parameters associated with integrated aft ship solutions. New possibilities, however, are offered by today’s advanced flow and pressure simulation tools like e.g. CFD (Computational Fluid Dynamics). Becker and MAN agree that this is where further improvements can be obtained. A common target - with clear benefits for ship designers, operators and owners. A chase for new potentials within thrust management, propulsion efficiency, cavitation control and noise reduction – resulting in improved manoeuvrability, lower fuel consumption, reduced exhaust gas emissions and better onboard comfort. Klaus Deleroi, Senior Vice President and Head of MAN Diesel & Turbo’s Business Unit Medium Speed, expresses his satisfaction with the agreement: “Both parties, Becker and MAN, have unique engineering know how to offer each other, and we have great expectations to the combination and outcome of these key competences”. Until further, the cooperation agreement has duration of five years, and the practical implementation of the cooperation into the daily work – will mainly affect Becker’s Hamburg department and MAN’s Aft Ship Unit in Frederikshavn, Denmark.